Glass House Mountains (also spelled Glasshouse Mountains) is a hinterland town and locality of the Sunshine Coast Region, Queensland, Australia, named after the famous Glass House Mountains of the area. Colloquially it is often known simply as "Glasshouse". At the 2016 census, Glass House Mountains had a population of 5,065. The town Glass House Mountains is located, approximately 64 kilometres (40 mi) north of Brisbane. 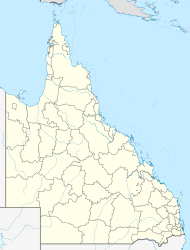 The town also has a train station and a railway line that runs northwards towards Northern Queensland and southwards to Brisbane. The Bruce Highway runs along the locality's eastern border. Many of the town's original foundations were built on sugarcane, pineapple and farming. All Saints' Anglican church was dedicated on 19 February 1939 by Archbishop William Wand. It closed circa 1993. The original European farmers that settled in the area brought soccer with them, and it has remained a popular local sport. The soccer grounds were built mostly using resources donated by farmers. The area was also used as a filming location for the movie Sinbad and The Minotaur, with Mount Coonowrin (Crookneck) (closed 1999), Mount Beerwah (closed 2009), Mount Tibrogargan and Mount Ngungun being shown predominantly throughout the movie. In May 2011, the remains of teenager Daniel Morcombe were found at Kings Road in Glass House Mountains. Morcombe had been missing, presumed murdered, since 2003 and his disappearance sparked a massive police investigation including a $1M reward. In the 2016 Census, there were 5,065 people in Glass House Mountains. 78.3% of people were born in Australia. The next most common countries of birth were England 5.7% and New Zealand 3.4%. 91.2% of people spoke only English at home. The most common responses for religion were No Religion 32.1%, Catholic 18.5% and Anglican 17.6%. The Sunshine Coast Regional Council operates a mobile library service which visits the Community Hall on Coonowrin Road. ^ a b c Australian Bureau of Statistics (27 June 2017). "Glass House Mountains (State Suburb)". 2016 Census QuickStats. Retrieved 31 January 2019. Material was copied from this source, which is available under a Creative Commons Attribution 4.0 International License Archived 16 October 2017 at the Wayback Machine. ^ "Glass House Mountains - town (entry 13887)". Queensland Place Names. Queensland Government. Retrieved 13 April 2017. ^ "Glass House Mountains - locality (entry 48648)". Queensland Place Names. Queensland Government. Retrieved 13 April 2017. ^ "Queensland Globe". State of Queensland. Retrieved 13 April 2017. ^ "Archbishop Dedicates New Anglican Church At Glasshouse Mountains". The Telegraph. Queensland, Australia. 20 February 1939. p. 14 (CITY FINAL). Retrieved 12 April 2019 – via National Library of Australia. ^ "Archbishop Dedicates New Anglican Church At Glasshouse Mountains". Telegraph (Brisbane, Qld. : 1872 - 1947). 20 February 1939. p. 14. Retrieved 3 April 2019. ^ "Mount Beerwah summit route—temporary closure". Queensland Government. 13 November 2014. Archived from the original on 4 September 2015. Retrieved 4 September 2015. ^ Shorten, Kristin (21 August 2011). "Bones found at Daniel Morcombe search site". news.com.au. Archived from the original on 21 August 2011. Retrieved 21 August 2011. ^ "Bankfoot House (entry 602702)". Queensland Heritage Register. Queensland Heritage Council. Retrieved 14 July 2013. ^ "Glass House Mountains National Park and Beerburrum Forest Reserve 1 (entry 602494)". Queensland Heritage Register. Queensland Heritage Council. Retrieved 14 July 2013. ^ "Libraries: Mobile timetable". Sunshine Coast Regional Council. Archived from the original on 30 January 2018. Retrieved 30 January 2018. This page was last edited on 17 April 2019, at 04:30 (UTC).